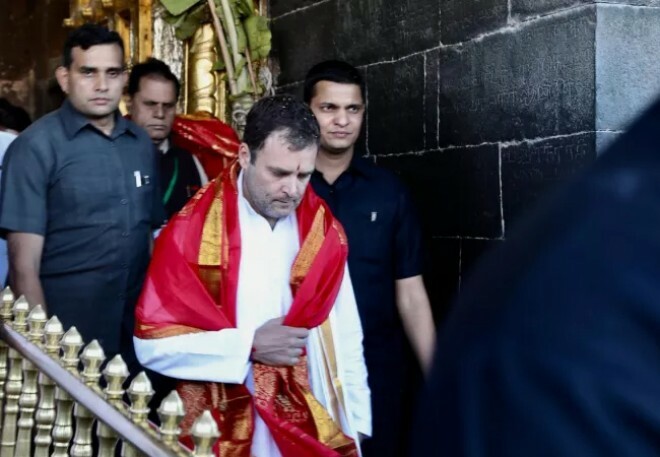 Tirupati, Feb 22: Congress president Rahul Gandhi on Friday offered prayers at the famous hill shrine of Lord Venkateswara at Tirumala near Tirupati. On his arrival at the temple main entrance, Gandhi was accorded a warm welcome by the hill temple management. After quickly trekking the nearly 10 km-long steep stairway leading to the ancient hill shrine, the Congress chief paid obeisance to the presiding deity of Lord Venkateswara, a temple official told PTI. It took about two hours for Gandhi to reach the sacred hills, the official said. After his spiritual trek from the foot of the hill at Alipiri in Tirupati in the afternoon, the Congress president made a brief halt at a heavily guarded Tirumala Tirupati Devasthanams guest house on the hill and later visited the shrine, the official said. After prayers, Gandhi was offered sacred silk cloth, prasadam, and a holy memento, the temple official said. He was in the temple for about 20 minutes. Tight security arrangements were put in place on the hills and all through the route leading to the hill shrine. Later, Rahul Gandhi left the hills to address a rally at Sri Venkateswara University Stadium in Tirupati. Since he was wearing the shoes while climbing the stairs,he was criticized by the people as well, as it is not considered pious to climb the stairs by wearing shoes.